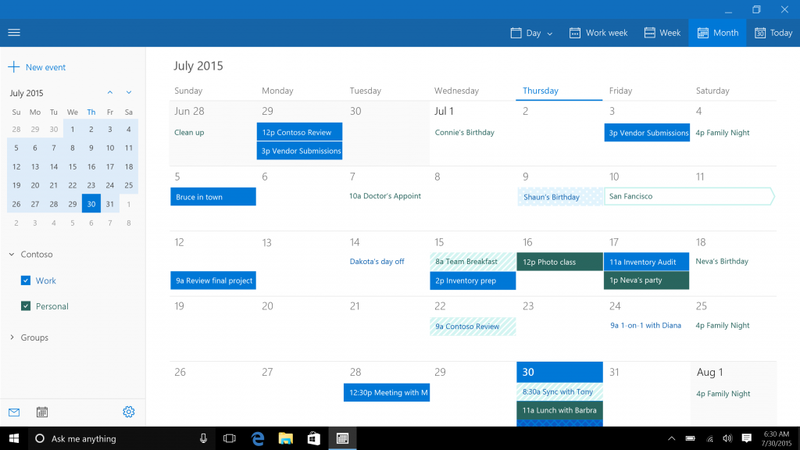 Look And Feel Of Windows 10 Built-in Apps Like Photos, Maps, Mail And Calendar, Groove, And Movies & TV*. 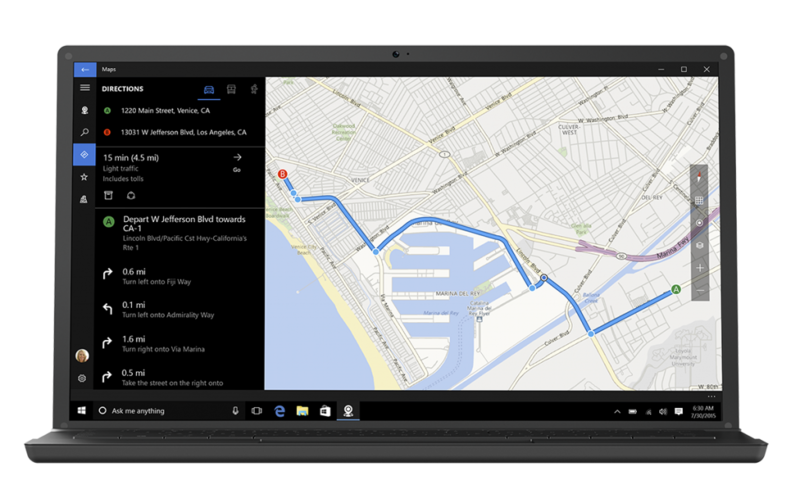 Maps On Windows 10 Helps You Navigate Your World With The Information That Matters Most To You. It’s A New Application That Works Great On All Screen Sizes, And Combines The Best Of Bing Maps And HERE Maps. Pin Your Favorite Locations To Your Start Menu For Quick And Easy Access, Or Add Them To Your List Of Favorites – And Maps On Windows Will Sync Them Across Your All Your Windows Devices. Enjoying Music And Videos Is Simple, Fast And Elegant On Windows 10. With Groove You Can Listen To Your Favorite Songs And Artists, Make Your Own Playlists, And Keep Up With All The Latest Hits. It’s Easy To Discover New Music With Radio—custom Stations Based On Artists You Love. For Ad-free Access To Millions Of Tracks With One Of The Largest Music Catalogs On The Planet***, Sign Up For A Groove Music Pass. Groove Is Easy To Use, Portable And Personal, With It You Get All The Music You Love, Everywhere You Want It. With The Movies & TV App, You Can Browse And Play Through Your Own Video Collection, Or Kick Back To The Hottest Movies & TV Shows In HD. You Can Import Your Personal Video Collection, And Play Back Your Content In A Fast, Elegantly Designed App That Is Optimized For Both Mouse/keyboard And Touch. Browse The Windows Store To Rent Or Purchase From A Huge Collection Of Entertainment Content, From Weekly New Releases On Movies To TV Shows A Day After They Air. You’ll Also Find Deals, Discounts And Personalized Recommendations Just For You Right From Within The Windows Store. On Windows 10 Devices, Xbox And The Web, The Movies & TV App Lets You Start Watching A Purchased Or Rented Movie On One Device And Pick Up Where You Left Off On Another. The Built-in Mail And Calendar Apps Get Even Better In Windows 10. 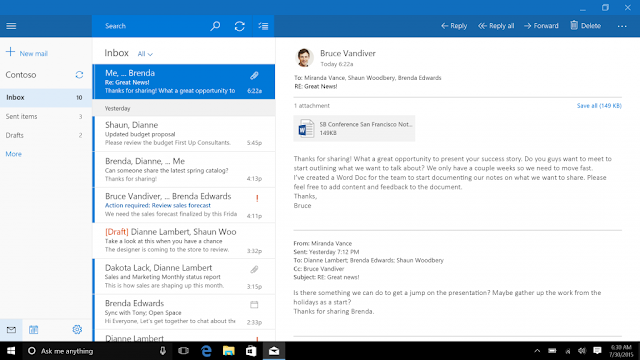 Crafting Emails Has Never Been Easier Or More Powerful, With The Familiar And Rich Capability Of Microsoft Word Built Into The Authoring Experience. Simply Insert Tables, Add Pictures, Use Bullets And Color To Get Your Points Across. Keep Up With Your Inbox With New Touch Gestures**** That Help You Read, Sort, And Archive Your Mail. The New Navigation Bar Is Quick And Convenient, Allowing You To Move Freely Between Your Email And Your Calendar, Making It Easy To Get Things Done. Manage Multiple Calendar Accounts With The Calendar App And View Your Week’s Schedule, Or Look Out Further In The Month View To Manage Your Appointments And Know What You Have Coming Up. 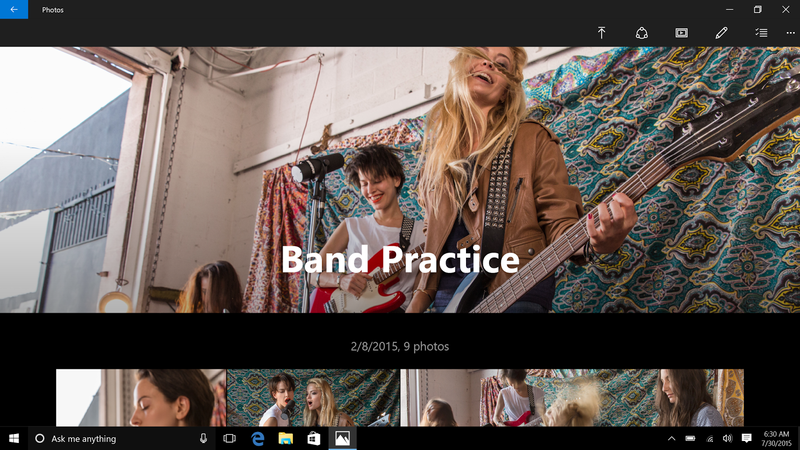 Put Your Best Photos Forward With Windows 10. The New Photos App Makes Sense Of Your Growing Collection Of Photos, Getting Them Organized And Easy To Navigate. You Can Sort Your Collections Of Photos By Date For Fast Access. *App And Content Availability And Experience May Vary By Market; Some Content Sold Separately. **Applies To Photos Taken With And Locally Stored On A Windows 10 Device. ***Groove Music Pass Is Sold Separately And Available In Select Markets. Catalog Size And Availability Varies By Market. ****Hardware Dependent. Bro why do you removed that comment??? ?